SCVHistory.com JE5401 | Canyon Country | Dyer Honey House, 1950s. 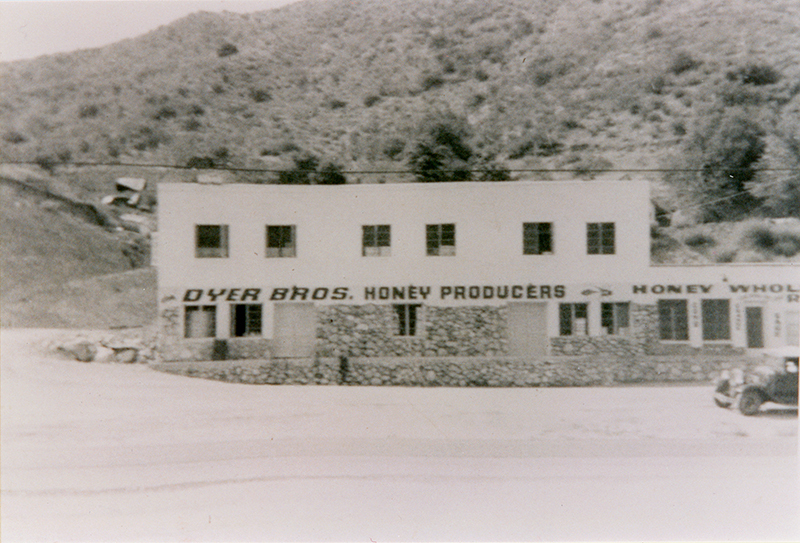 Dyer Honey House on Mint Canyon Road (now 17262 Sierra Highway), seen about the time it was new. It was built in 1954. The Honey House at 17262 Sierra Highway — as of 2005, part of College of the Canyons' Canyon Country campus — was built in 1954 by James Willis Dyer (1910-1987) to process honey produced at his family ranch at Vasquez Rocks, next door to the Asher property. Born in San Fernando, Dyer moved in the 1930s to his his uncle's Ritter Ranch in the Leona Valley, where he got his first taste of honey. He then moved to Agua Dulce and in 1950, with bees he bought from his uncle, started his own apiary business. Dyer had worked for the county road department and produced honey to supplement his income, but it eventually became his sole source of income, according to his daughter Letty (Dyer) Foote. The bees fed on the local sage, buckwheat, greasewood and juniper, allowing Dyer to produce several varieties of honey. County assessor records list the two-story brick Honey House at 3,512 square feet with two bathrooms. On the same 2.18-acre parcel, on the hill overlooking the house, is a 942-square-foot cabin (2+1) built in 1937. Set into the hillside behind the Honey House is a subterranean cellar where honey was kept cool. Known as the Dyer Honey House until the 1960s when it was sold to another family of beekeepers, Joe and Margaret Warmuth (at which time it became the Warmuth Honey House), the machinery in the building could process up to 3,000 honeycombs at a time. Extracting machines on the second floor spun out the honey, which was then conveyed through pipes to tanks on the ground floor. It was packaged in jars of various sizes and sold to nationwide distributors and directly to the public. It was a popular stop for travelers on the Mint Canyon road. In 1986, Margaret Warmuth (1925-2006) converted the former sales office into a small "Honey & Bee Museum," and in its final years, the proprietors opened a custom leather shop in the building and made saddles. The Warmuth family (Estate of Margaret Warmuth) sold the property to the Santa Clarita Community College District for $749,000 on April 21, 2005 (grant deed recorded June 3). The college's general contractor, Lundgren Management Corp., used it as a construction office for the new campus. JE5401: 9600 dpi jpeg from copy print.